« Resilient Melbourne three years on: are we any better prepared today to manage the challenges of tomorrow? 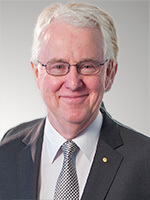 Terry Moran AC is one of the most influential leaders ever to come out of Victoria, leaving a lasting legacy of public sector reform and an exemplar of commitment and integrity in service to Australians. Over a wide-ranging 40-year career, Terry Moran has occupied a variety of senior positions in the Victorian and Queensland governments becoming the Secretary of the Department of the Prime Minister and Cabinet between March 2008 and September 2011. Retiring from being Australia’s most senior civil servants, Terry knows national governance. Do we have a problem? Where is Australia headed?